On a bright summer morning, I woke up to the aroma of freshly brewed coffee wafting into my room and thus began my rendezvous with the spice and coffee gardens of Coorg. 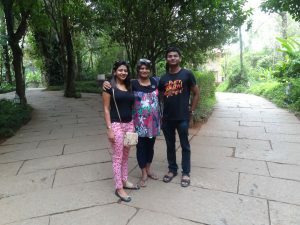 Escaping the scorching heat of Mumbai, our family decided to vacation at the pretty hill stations nestled in South India. As we journeyed from the airport to our villa in the heart of Coorg the landscape changed drastically from the city’s busy roads and stylish houses to lofty mountains and lush green valleys often teasing me with Kodak moments of milky white waterfalls, but nothing prepared me for the beauty of the coffee and spice estates laid out before me. I was intoxicated! The chirping of the birds, the beauty of wild flowers exploding with colors, aromatic coffee and scent of spices stimulated to life every unknown sensation. I made Coorg my home for three days waking up early each morning to the whiff of fresh brewing coffee and the whispering of the woods. Starting early one morning we visited Dubare Elephant camp. Here several elephants, young and old are cared for by their mahouts. Each morning these majestic animals come walking down the slope to immerse themselves in the river water. I got a chance to bathe these elephants, rubbing their rough, thick skins with my gentle delicate hands. It was fascinating watching these mammoth animals, along with their little baby elephants use their trunk to splash water teasing the onlookers. Digging into the local cuisine is a big part of understanding the culture of any place and in Coorg, I delighted in the spicy Coorgi pandhi curry pork with rice balls and succulent pork chilly. 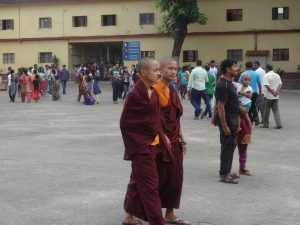 Coorg is also home to a large Tibetian population that have been living here since several decades now. At the Golden Temple, I chanced upon thousands of monks, coming together to say their prayer, to drum beats as they recited their verses. It was captivating..
After spending 3 magical days and nights in Coorg, Putty Chery our driver, took us to Ooty the Queen of the Nilgiris. The drive was one of the sheer natural beauty with stunning landscapes, as we drove past Mysore and into the heart of the jungle areas of Bandipur and Madumalai. We chanced upon several wild elephants, deer and monkey as we drove through the heart of the wild life den. After leaving the spell bound forested area behind we hit the ghats up the Nilgiris, as the temperature kept dropping every few minutes. As we reached our cottage accommodation atop the mountain, the fiery orange ball sank behind the mountains and the chillness in the air increased. Not used to such temperatures even in the coldest of nights in Mumbai, I was glad to hear that there was a bonfire set up. 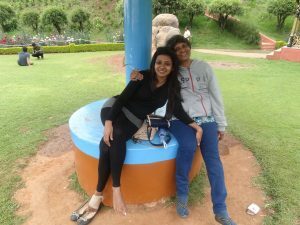 The next morning we explored the sights and sounds of Ooty. The visit to the Tea factory was interesting and educative. Tea leaves are collected, crushed, dried and made into tea powder. Before leaving I was offered a on a pipping hot cup of the famous Nilgiris chai. Our last evening, as we sat munching on steamed momos surrounded by the panaromic Nilgiri mountains, I knew that no sooner I get back to my bustling city of Mumbai, than I would miss the warmth of the Coorgi folk and the crispness of the mountain air up here in the Nilgiris. Next Post:Do you know how to celebrate Diwali in India?